Come draw from life and hone your skills in our fully equipped studio. This drop-in, no instruction drawing group is intended for professional artists, students, and those looking for some practice in this time honored tradition. 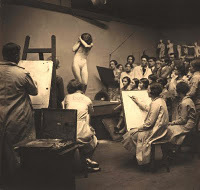 Easels, drawing tables, stools and professional life models are provided. Bring your own materials and drawing board if you need one. All materials are also available for purchase in our school store. Plenty of parking and the M line stops right outside our front door!